The weekend a couple of weeks back now didn’t start well. I drove to Martin Down in Hampshire hoping to see the Marsh Fritillary butterfly only to be greeted with wind and horizontal rain. Sitting in the car listening to Radio 4 didn’t help, nor did muttering to myself. Giggling at a couple of twitchers in bright blue anoraks carrying a tripod and scope large enough to zoom in on a bird in France amused me for a while. But hey, there’s only so much chortling you can do on your own in a car in the middle or nowhere before it begins to look weird, so I drove home again. On Sunday I awoke to a leaden sky and… drizzle. Much swearing ensued. Ever the optimist I set off to Langford Lakes for a Dragonfly walk and talk by Steve Brooks from the Natural History Museum, London. And what an interesting talk it proved to be. 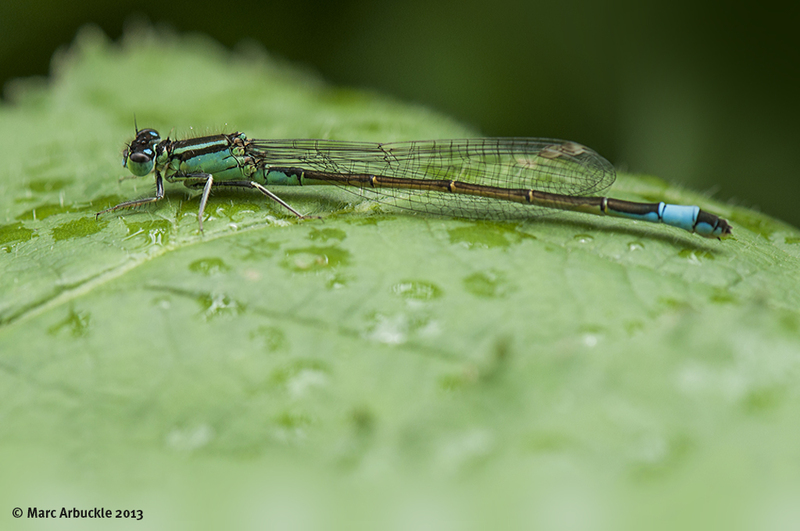 As I’d arrived a little early I wandered on down the track past the education centre and discovered this handsome fella on a bramble leaf sheltering from the rain which I later identified as a male Blue-tailed Damselfly Ischnura elegans. Damselflies and Dragonflies belong to the insect order Odanata. There are about 5,300 species of dragonfly worldwide but only 39 species breed in Great Britain and Ireland. As far as the UK is concerned they are divided into two suborders, Anisoptera (dragonflies) and Zygoptera (damselflies). Dragonflies are the more robust and larger of the two, have bigger eyes and the front and back wings are dissimilar, anisoptera means ‘different wings’. They are strong flyers and when at rest hold their wings out horizontally. Damselflies are far more delicate, with thin bodies and have a weaker, fluttering flight. Their front and back wings are the same shape, zygoptera means ‘paired wings’ which when at rest are generally held closely together behind them. See photo above. If you are a fan of these beautiful insects then why not build a pond? Even a small pond will soon encourage 3 or 4 different species into your garden as long as its not too shaded by trees or overpopulated with fish. For a comprehensive guide to Odanata I can thoroughly recommend the Field Guide to the Dragonflies and Damselflies of Great Britain and Ireland by Steve Brooks and illustrated by Richard Lewington. Great pic and post. Although, I’m wondering what a “twitcher” is, lol. And thanks for talking about the difference in dragon and damselflies. I’ve studied dragon and owlflies but not the damsels. A ‘twitcher’ in this context is someone who is so passionate about bird-spotting they will rush anywhere in the country at a moment’s notice to see some rare bird. There is a lot of jargon associated with twitching. For example, to get a ‘mega’ means to get a really rare bird. To ‘dip’ means to miss seeing the bird. And one for you, to get a ‘yank’ means to get a bird from North America. Thank you again. Although perhaps I’m being a little unfair to twitchers. I’m a big fan of birds and a little obsessive myself. Martin Down is known for its rarities. Who doesn’t get a little misty-eyed at the sight and sound of turtle doves for example.